The Growers Guide has arrived! Look for it on the BC Ferries, Chamber of Commence, Visitor Centres and many locations. Check out the digital copy here. Coombs Farmers’ Institute invites local agricultural businesses to take advantage of this amazing new opportunity to advertise in a Growers Guide, listing farm businesses from Deep Bay to Nanoose Bay. What is the Growers Guide? 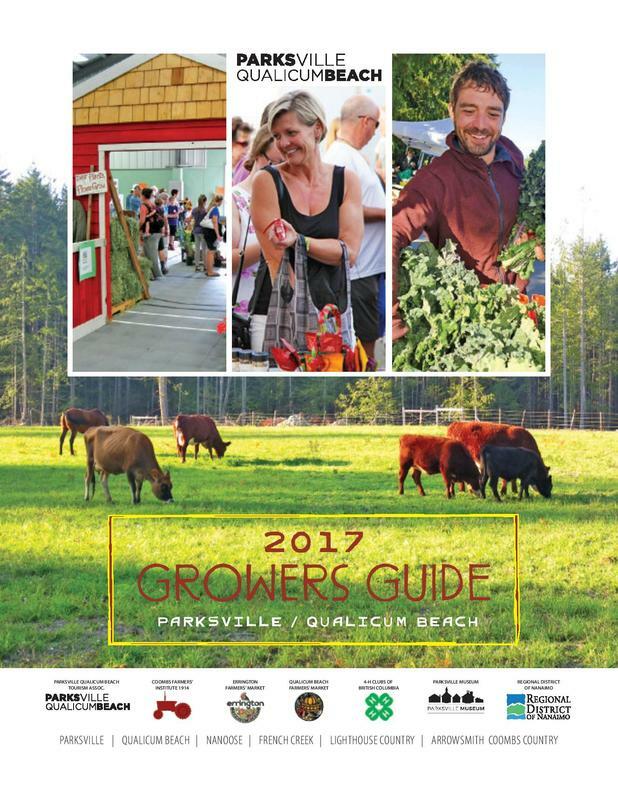 The 2017 Parksville Qualicum Beach Growers Guide is an Agricultural directory of the businesses that are in our area. It encompasses a wide range of businesses from farms, local food producers, equestrian services, workshops and much more. Places like Port Alberni, Victoria and Comox already have their own Growers Guide and it is NOW time for our region to create a guide. We are encouraging all local food producers and related businesses to advertise their product in this Guide. This is as much a community building exercise as anything. This FREE Growers Guide will be published by the Parksville Qualicum Beach Newspaper in February 2017. 40,000 copies will be distributed through the Newspaper, Farmers Markets', Visitor Centres, Chambers of Commerce, Local Businesses, on Farm Stores and the BC Ferries! The deadline to place an ad in the 2017 Growers Guide has passed. Coombs Farmers’ Institute and our funding partners would like to introduce our contractor, Liz Kawahara. I’m a Vancouver Island University student that has worked on local farms over the past 4 years. While working on farms I was able to get an understanding of the struggles that farmers, local producers and people who support our community go through with the balancing act of maintaining a business and marketing. I am excited to meet more of our community members and be a part of a team to create a centralized place where our community can showcase what we have to offer and bring our community closer together.